Graduate workers will occupy the University of Wisconsin-Madison’s administration building on April 5th. This action, organized by the Teaching Assistants’ Association, is to demand from university administrators a living wage, full fee relief, quality policies, and a role in decision-making that affects graduate employees. These issues harm the university’s research capacity, the quality of undergraduate education, and the Wisconsin Idea of serving local communities. Hundreds of graduate students have signed a pledge. A speech session will start at 11 am in the lobby of Bascom Hall. Graduate worker pay at UW-Madison lags behind that of peer institutions despite the recent pay raise for teaching assistants. Pay for other categories of graduate workers has remained stagnant. The annual income of a typical graduate worker is still below the living wage in Wisconsin according to the Massachusetts Institute of Technology. Mandatory fees are a big part of the problem. Fees continue to rise, and the UW–Madison administration recently added a fee for all international students after increasing their tuition by one thousand dollars over that of non-resident students. Many graduate workers pay ten percent of their wages back to the university. One in seven graduate students faces food or housing insecurity, according to the most recent result of UW-Madison Campus Climate Survey. In addition to mandatory fees, graduate workers at UW–Madison do not have clear policies governing employee responsibilities and rights since Act 10. Graduate workers have worked with the administration to translate the pre-Act 10 contract into official policies and procedures. A year after administrators received the final product of these discussions, graduate workers are still waiting for the policy. Meanwhile, department administrators and supervisors are not trained on how to support their employees. To avoid these issues in the future, graduate workers call for a role in decision-making, since university employment policies directly affect their working conditions. Wisconsin has a history as a laboratory of democracy. That culture should not stop short of the administrator’s office. Financial and workplace burdens on graduate workers imperil UW-Madison’s reputation as a world-renowned research university and the education of undergraduate students. Graduate workers have exhausted bureaucratic channels, but administrators continue to stall. 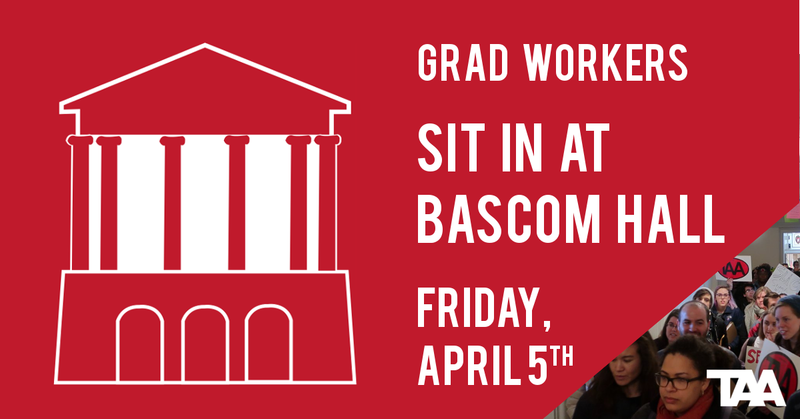 As a response, graduate workers and allies will gather in Bascom Hall on April 5 to call for immediate change. The media and the public are encouraged to attend. Our university can provide fair pay and fee relief. The UW System is preparing for a budget increase of hundreds of millions of dollars over the next two years. We need less than 0.21% of UW–Madison’s current budget to pay for our mandatory fees; the university has the funds to provide full relief from mandatory fees while increasing the pay for grad workers. Other universities are doing better. Peer institutions like Michigan State University and University of California–Berkeley have higher pay for graduate workers and cover more than 95% of fees for those workers. The international student fee is discriminatory. Our administrators implemented this fee four years ago when they were facing more budget cuts from Governor Walker. The City of Madison passed a resolution back in 2003 calling this fee discriminatory. Chancellor Wiley called on the university to cover this fee that same year. We need to push our administrators to keep their promise to international students. We need clear, consistent, and quality policies. Graduate employees have been working without an enforceable contract since 2011. Graduate employees who feel overworked or unsafe in their workplace have little recourse to resolve that issue. The TAA has been working with administrators in good faith for over 3 years to get renewed policies and procedures in place, and they have yet to be signed into practice. Organizing gets the goods. Graduate workers at University of North Carolina at Chapel Hill won fee relief earlier this month after showing their strength to withhold grades. Grad workers at Northwestern University forced their administration to end international student fees on the eve of a large demonstration. Grad workers at University of Illinois at Urbana-Champaign won better policies last year with a strike. TAA is the oldest graduate student labor union in the United States and advocates for a university that is fair to all—including students, workers, and our families. Graduate student workers perform nearly half of all the instruction that takes place at UW, while also taking classes and conducting research. The university works because we do. For more information, please contact TAA co-presidents Chance McMahon (chance@taa-madison.org) and Sara Trongone (sara@taa-madison.org). Media requests can be directed at TAA Publicity Committee (pubcom@taa-madison.org).